I really enjoy making confectionery and sweetmeats, so I thought, why not have a new section on my blog dedicated to these treats. I bring you the #ConfectionCollection, these are easy recipes that generally require a bit of initial precision and then all you need to do is leave your sugary treats to set. Confectionery makes a great gift and it’s a lovely way to round off a meal. Try it next time you’re entertaining, a couple of squares of silky truffle or fudge served straight from the fridge with a hot black coffee is the perfect combination of hot and cold and sweet and bitter. I hope to update this collection weekly and if you have any suggestions for confections you’d like me to make, let me know in the comments. I’m hoping to tackle things like Turkish delight, fudge, marshmallow, caramels, truffles and toffees. 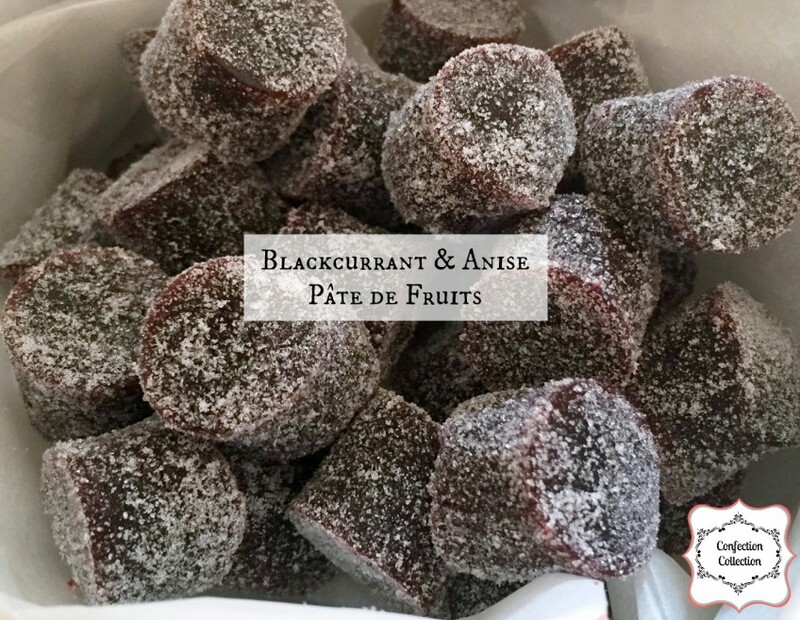 I decided a little while ago that I wanted to make pâte de fruits, it looked interesting and I wondered if it would be anything like fruit pastilles. In this recipe I paired anise with the blackcurrant as I enjoy the two flavours together. Feedback has told me that others don’t necessarily feel the same way, my boyfriend said they tasted like a chewy Rinstead pastille. A mouth ulcer treatment wasn’t the taste I was going for, so if you aren’t a fan of anise, do leave it out of the recipe. Pâte de fruits is a little like making jam, all of the ingredients are combined together, then allowed to boil until reaching 104°C. When this temperature is reached the goo is poured into a lined tin and allowed to cool for 2-3 hours. The process is fairly quick due to the inclusion of liquid glucose and additional pectin. The set jellies are sliced with a knife, or cut out with a cookie cutter approximately 1.5-2cm in size and then rolled in caster sugar. 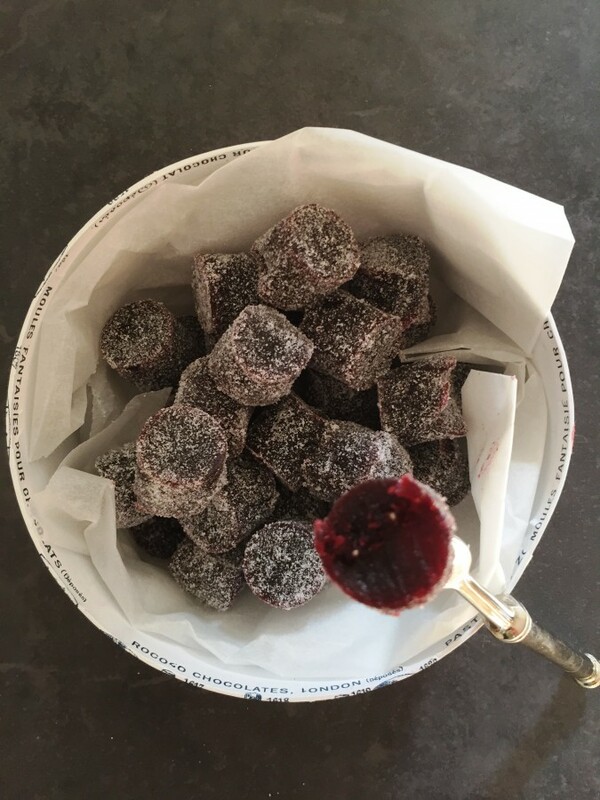 The blackcurrant & anise pâte de fruits will keep at least a month stored in an airtight container in a cool dry cupboard or in the fridge if it’s humid. If you find that the pâte de fruits starts to become sticky or sweat a little, just dust them with more caster sugar before serving. Line a loaf tin or a 20x20cm cake tin with greaseproof paper and have it nearby. The loaf tin will produce thicker pâte de fruits and the cake tin will give thinner, so it's down to your preference or whatever tin you have in the cupboard. Place the puree, 150g of the sugar and liquid glucose in a heavy bottomed pan and bring to a boil. Mix the remaining sugar and pectin together, when the puree mixture has come to a boil, whisk in the pectin and sugar and cook on low until the temperature reaches 104C. Add the lemon juice and the anise, continue to cook for another 3-4 mins. Pour the pâte de fruits into the tin and leave to set for 3 hours. Cut the fruit into your desired shapes and sizes and roll them in the sugar. Store in an airtight container in a cool dry cupboard or in the fridge. 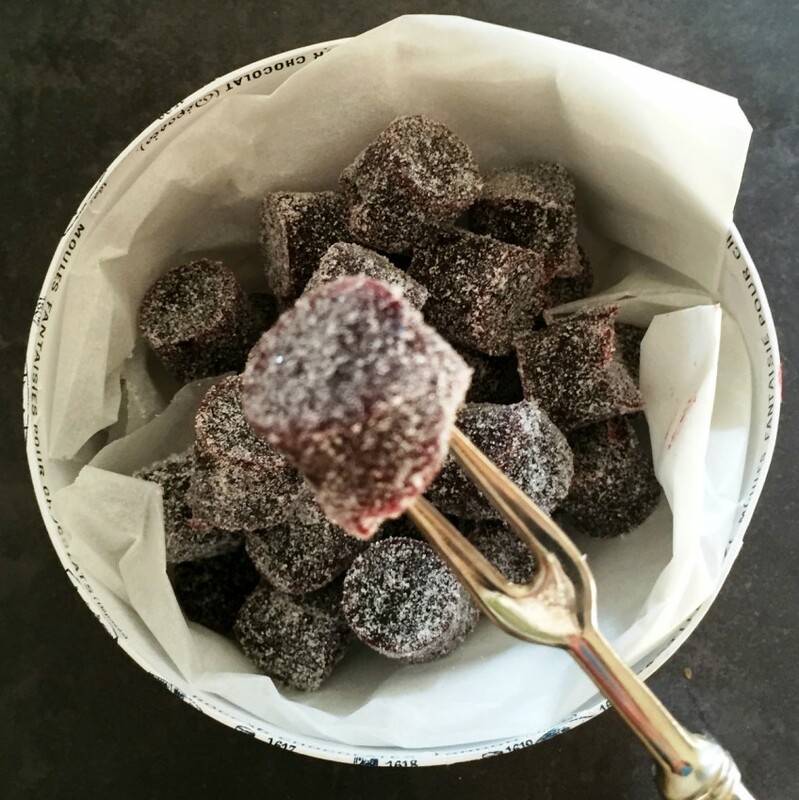 Pate de fruit is on my confection bucket list! These look so tasty. Thank you. You should definitely make them, they are so tasty. I was surprised how easy they are too! I love those sweets too Louise. It’s the first time I’ve ever made jellies and I was pretty surprised how well these turned out. I think I’ll use a citrus fruit next time I make these. These are definitely my sort of thing as I love all sugar covered jelly type sweets (I’ve been known to pinch the boy’s jelly tots when they’re not looking, although I suspect homemade will taste much nicer!). Is the aniseed flavour anything like the bobbly sweets in liquorice allsorts? Yes that’s exactly what these taste like! I forgot about those liquorice allsort ones! I love jelly sweets like these too. Homemade sweets like these are amazing, I’d love to make them with orange or lime another time. I thought the mouth ulcer thing was harsh, but my boyfriend can be tougher than Gregg & John, or Paul & Mary! I love the thought of making these! I had some delicious mango and passion fruit ones at a restaurant recently and try were delicious so I’ve been meaning to try recreate them! Love this as an idea for a series and can’t wait to see what else you come up with! Thank you Laura – I’m really excited about this series, I really want to master as many homemade confections as I can. They make such great gifts. Mango and passion fruit sounds amazing, I love those flavours! I used powdered pectin, I don’t have any experience of using liquid, but I’ve used powdered for this and for jam making with soft fruits.